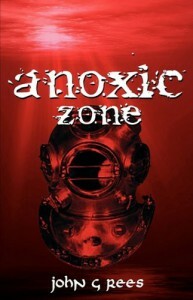 anoxic zone by John G. Rees - Towers of Books Come Tumbling Down! Note: Received this book for free for an honest review. Summary: In a society where corporations own people, Megacorp has created the perfect workers, pharmaceutically-created immortals who they have the ability to send into the harshest conditions on the planet. Jake is a diver who on a dive discovers an ancient secret, one that Megacorp wishes to own and control. But the secret is violent and erratic, and Jake is sucked into a dangerous game he never intended to enter. Review: Vampires in a dystopian future... what a tremendously awesome premise! The idea and plot are very original and exciting. The dystopian future could use a little refining but I am hoping more details will be included in the sequels. The tone of voice of the characters is very distinct. It is a little odd that the first section of the book is in first person POV while the second section switches between characters but I can see how it is convenient for the purposes of storytelling and after having to make a minor mental adjustment I didn't mind the switch at all. The diving aspect is very original and interesting, and so is bringing in the ultimate historical vampire into the story. I can't stress how enjoyable it was to read something so different and un-cliché as this. I relished the novel greatly even though it had some editing problems: grammar, punctuation (mostly with commas/periods around quotations), and a little bit of a continuity issue. The continuity issue had to do with the journals, a journal was read early on in the book before the mentioning of journals to the character who read the journal beforehand. It really is a minor issue but a few years back it was my job to be picky with text so it kind of stuck. However, these issues weren't so bad that they detracted much from the enjoyment of the story (although the author should consider editing before printing the next edition). That said, the story kept me turning the pages; it was certainly an exciting and unique read.